The Lightning and the Capitals are playing an awesome, intense back-and-forth game tonight, and Tampa Bay took a 4-3 lead in the second period on a PP goal that was pretty much the pinnacle of what their forwards can achieve. As Washington tried to escape their own zone after a scramble for the puck, Steven Stamkos robbed an off-balance Matt Niskanen and smoothly sent the puck over to Brayden Point, who got it to Ondrej Palat in prime position in the slot. But Palat passed up the opportunity to shoot, and so did Stamkos when he received the clever drop-off. 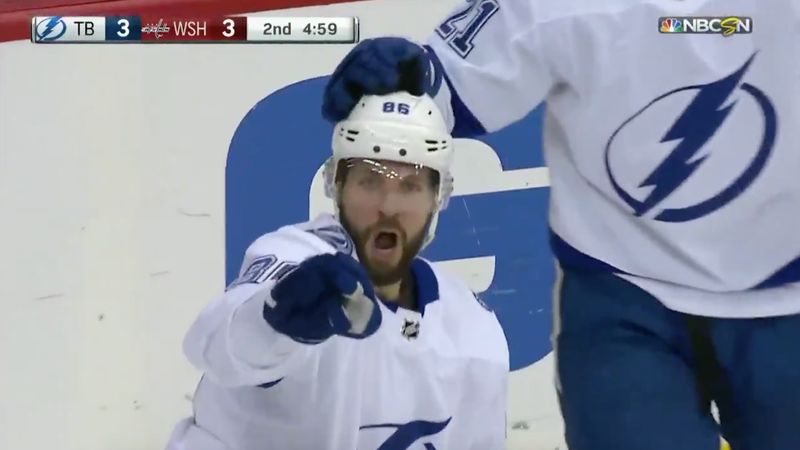 It was the captain’s backhanded pass that set up leading NHL point producer Nikita Kucherov for a deadly finish past a powerless Braden Holtby. All that happened in about four seconds. Kucherov, who also scored Tampa’s first on a powerplay shot from the right circle, is a terrifying weapon with the man advantage, but this entire unit is just ridiculously beautiful, and holds the potential for showstopping goals whenever their opponent gets hit with a penalty. They’ve already clinched the Presidents’ Trophy, so the Lightning are just playing these last few regular season games for fun, but man are they making them worth our while. Are The Lightning So Good That They Didn&apos;t Need To Get Better?